Instrumental from start to finish, The Horseshoe Curve showcases Anastasio's Afro-Cuban-influenced improvisations, replete with five-part horn arrangements, tight breaks, multiple percussionists, and of course, Anastasio's soulful, nimble guitar work. 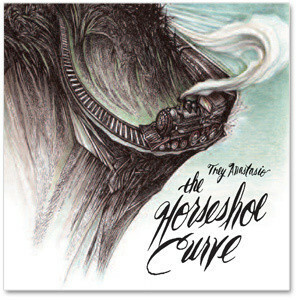 The Horseshoe Curve is a journey, an inventive exploration of the big band funk that Anastasio has been steeped in for the larger part of the decade. The Horseshoe Curve was recorded with producer Bryce Goggin at The Barn, Anastasio's studio complex in Vermont, as well as Trout Recording in Brooklyn, NY. Alongside Anastasio, the band includes sax players Dave Grippo, Peter Apfelbaum and Russell Remington; trumpeter Jen Hartswick, trombonist Andy Moroz, keyboardist Ray Paczkowski, drummer Russ Lawton, percussionist Cyro Baptista and bassist Tony Markellis.